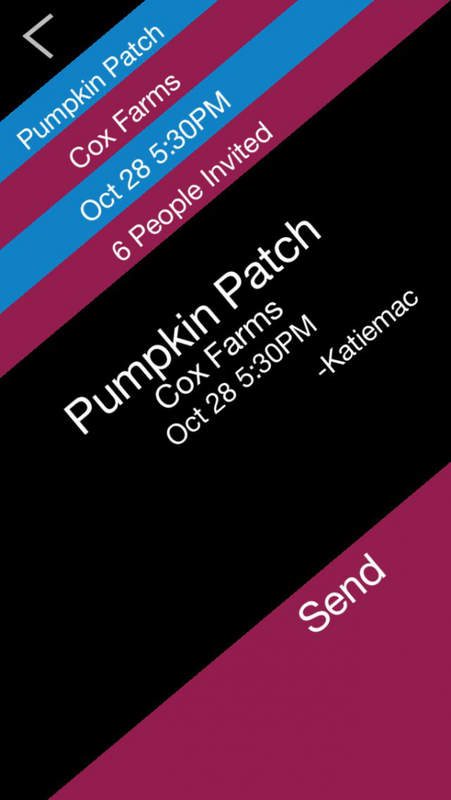 LMK (Let Me Know) fills the gap between group text messages and formal event planning platforms. We often invite friends to activities needing IN/OUT commitments or a headcount but we don’t want anything difficult or formal. Unlike group messaging platforms that require accounts and setup, LMK is immediate and fun. Everyone we invite is either IN or OUT. No pressure, no excuses, no surprises. 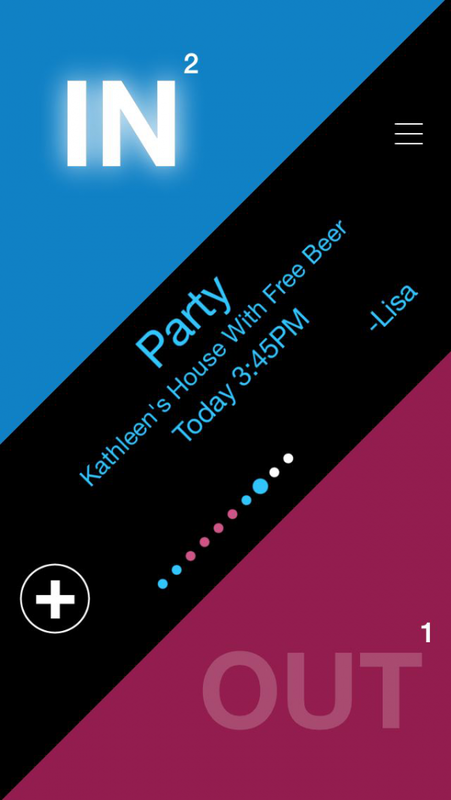 LMK is the easiest way to organize informal social activities. LMK is the easiest way to organize informal social activities. This simple concept has been wrapped in premium design that people find unique, approachable, and current. Every detail about LMK is iconic and unlike anything consumers have seen before. LMK challenges the status quo by turning everything on its side, literally. The app is memorable and authentically adapted to its single purpose. Customers say the most exciting part of LMK is “no excuses”. You just tap IN or OUT and that’s all the organizer is expecting to hear. It doesn’t matter that you’d rather mow the lawn than go to their party, OUT is OUT. LMK ends the era of excuses, awkward explanations, and reluctant YESes. LMK is the simplest way for an organizer to get an accurate headcount while alerting those invited to the time and place. If people don’t have the app then LMK sends a SMS text message with enticers to download the app. LMK’s frustration-free reminders are delivered by a special algorithm that computes the ideal time to remind those who haven’t responded, helping ensure an accurate headcount and frustration-free experience. LMK never pesters users with lengthy setup, nor does it shakedown users for personal information. Execution is everything, and even the most delicate details have been attended to. The app is available on Apple iOS and Android. They say “creating simple is hard”, which captures the essence of LMK’s design-innovation. As a simple idea LMK would have been easy to implement except that the studio needed this product to be iconic and unique, yet approachable and authentically current. We had to imbue the design with innovation to make it original while fitting every detail to the simple single-purpose that is the app. That’s hard. 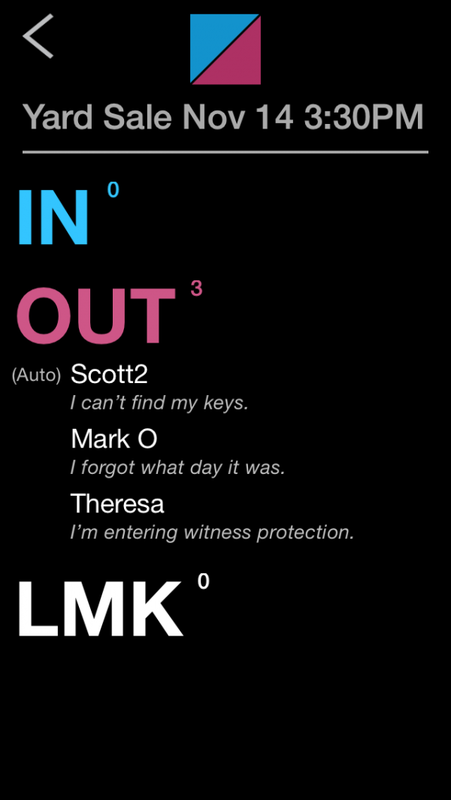 Launching the app for the first time the user is immediately immersed in LMK’s world. It features a completely unique diagonal sloped user experience with intuitive interactive gestures. 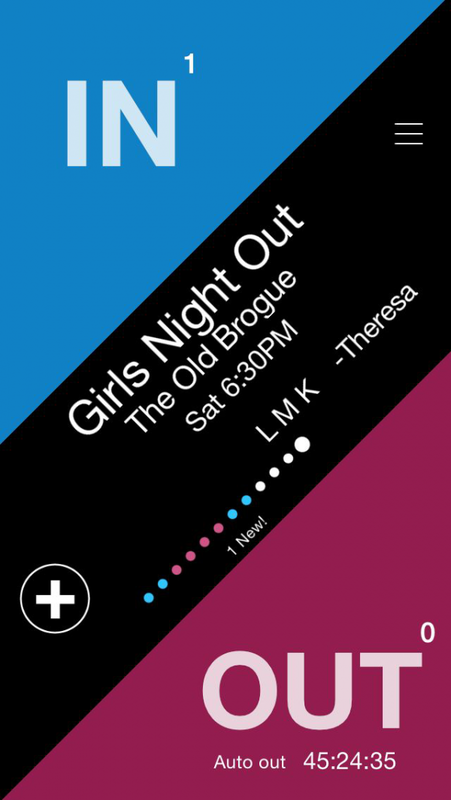 The app imputes the simplicity our audience expects through an iconic design that people instinctively associate with LMK. Also upon startup, our innovation is apparent in what’s not there. Unlike category competitors, there is no lengthy account provisioning or setup process. Onboarding a new user is a simple 3-step process. This is innovative because legitimate reasons drive other apps to play “twenty questions” on setup; and getting around asking those questions required significant innovation. Design-innovation is but one dimension to what the studio accomplished with LMK. On the technical side, a custom algorithm was developed to determine precisely when a person should be reminded to reply IN or OUT to an activity they’ve been invited to (not as easy as it sounds). First impressions are everything, and that’s the case with LMK. From the first impression to the last, LMK is distinctive and authentically adapted to its single-purpose. LMK has been designed with the experience first, featuring an iconic diagonal sloping user experience and frustration-free setup process among other details. In LMK, design isn’t a superficial skin of graphic art, design is fundamentally baked into the soul of the app. All interactions are consistently distinctive and authentically adapted. One key aspect of the design was including just the right amount of animation without dominating the design. It was important for the app to appear organic through animation yet know its place as a tool people use to accomplish something quick. Animation in LMK ranges from a few relatively bold visual effects to barely noticeable lighting, all balanced to create a mood and deliver a modern experience. Psychology was a key factor in LMK’s design. It was important to give LMK a casual personality with just a touch of playfulness. Balancing the conversation with carefully scripted text specially tailored for context-sensitive situations took time and iteration. The final touch was to generate playful excuses for those who decline invitations with the note that we take care of the excuse for them. Marketing has already stared in preparation for LMK’s launch to the public on October 30, 2014. The studio is currently conducting preview and beta testing with early adopters. Beta test panels will be the first consumers alerted to the public launch. Beyond the customary marketing channels (paid advertising, PR, design contests, etc. ), the audience is intrinsically part of the marketing for LMK. In fact, the biggest marketing opportunity for LMK is the outreach that is innately part of the product. When someone uses LMK, they send invitations to friends who then learn about LMK. The marketing strategy is heavily focused on converting invitees into users of the app. Our team will measure the effectiveness of several variations on messaging to determine which drives conversion best. The formula for engaging consumers is to offer something meaningful in the app. We will be paying close attention to user feedback on the app as well as to what drives conversion to get both sides to where they need to be and engage widespread adoption. Our strategy leaves room for good luck and happy accidents, which every app developer needs. LMK uses a 2-step user verification process where we send an activation code to a user’s own mobile telephone number. Incorporating activation codes not only simplifies the provisioning process for new users, it makes it unnecessary to capture personally identifiable information beyond the phone number. This is both a security and privacy feature for our customers. LMK requests access to a customer’s contacts on the mobile device, something they can decline but with consent it allows for the best experience. At no time does LMK upload any contact information to external servers. A customer’s contacts are only accessed by the app when the user is inviting people to an activity, and then only the mobile telephone number is used.